Will We Ever Break Down the Silos? – Ruth Catchen Reach for the Stars! Life is messy. Like it or not, it just is. I would prefer to organize everything into neat piles and only bring them out when I am comfortable, but that is not the way life has gone for me. This compartmentalizing skill may be very valuable when organizing your closet or your kitchen so you know where things are, but it doesn’t replicate how we learn and problem solve. Simply said, that is not real world experience. The use of critical thinking or the ability to apply what you know and have learned from other experiences to new experiences is invaluable. This process is really important in living-regardless of what the job is. After all, we are total beings. Our functions are not separated by category. When I grocery shop, I need to calculate how much of certain ingredients I need to make something, and I need to figure the cost into my budget. These factors go along with: Will this be a healthy meal? Does it provide a variety of nutrition while pleasing those who will eat it? Who will be eating this meal? Do they have any dislikes? I am a multi-faceted person who can do many different things. Each endeavor that I tackle brings with it the sum total of my life experience. They cannot be separated. So, all of that problem solving ability and life experience combines in each new tackled adventure. At the same time, if you change anything that you did in the past (if you could), the next steps would be different. So how can you know if there would be a different outcome? I often use this reflection with students, and I have used it long before the movie and phrase The Bucket List became mainstream. I believe this story from my heart. For this reason, I am here to teach and give back. As we go through life, especially as a young person, we collect things and experiences, learning and absorbing from it all. You take all of this “life experience” and put it in your bucket. As life passes, it collects and all the things mix together to inform and become you as a unique person. At some point, you realize it is time to start taking things out of your bucket and giving back to others. That is how we all learn from each others’ life experience. For me, this has been a great pleasure. I have worked very hard in very demanding situations and it has made me who I am. Although there are things I would like to change, those experiences, as they are, make me different and give me something to inspire others. Believe it or not, I was conducting a concert of my youth chorale years ago, and I was narrating and informing about what we do and how the students learn. This story spontaneously came out of me and I have never forgotten it. This moment depicted exactly what I value about my life, my experience and my ability to process, critically think, and use all that I have learned to teach others. There isn’t much more to say. We need to break down the silos because the individual skills will be learned through solving problems and meeting challenges. Learning happens from a variety of integrated experiences. We must never forget that we are each unique beings. We bring distinct aspects of ourselves to anything we do. That individuality celebrates our humanity. 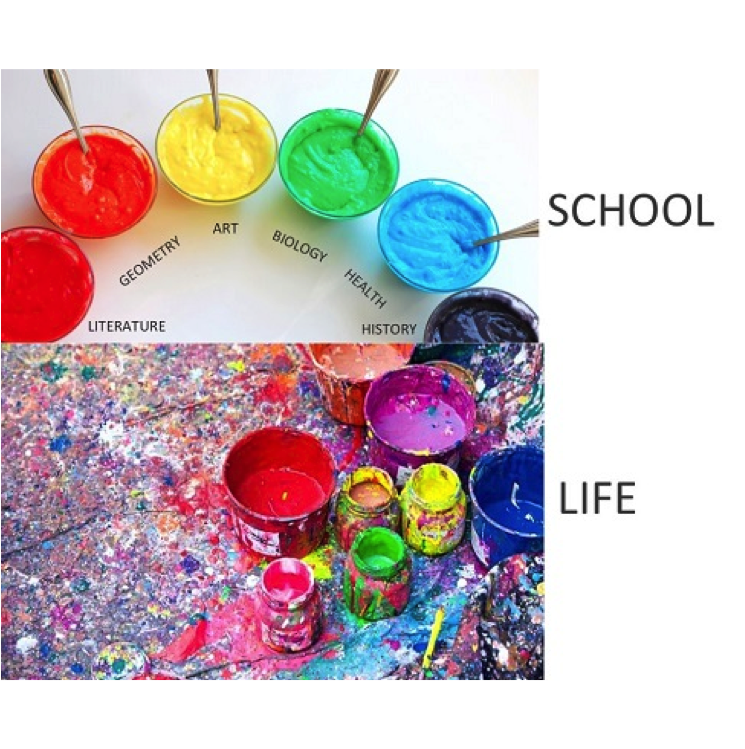 Let’s stop teaching just to learn stuff and instead, have real world experiences that add new colors to our palette. We are not all the same, and as a result, won’t look at life the same way. That is the joy in experiencing life and acquiring knowledge. By allowing each of us to be unique, we celebrate inclusiveness and diversity.